When LXD 2.0 shipped with Ubuntu 16.04, LXD networking was pretty simple. You could either use that “lxdbr0” bridge that “lxd init” would have you configure, provide your own or just use an existing physical interface for your containers. While this certainly worked, it was a bit confusing because most of that bridge configuration happened outside of LXD in the Ubuntu packaging. Those scripts could only support a single bridge and none of this was exposed over the API, making remote configuration a bit of a pain. 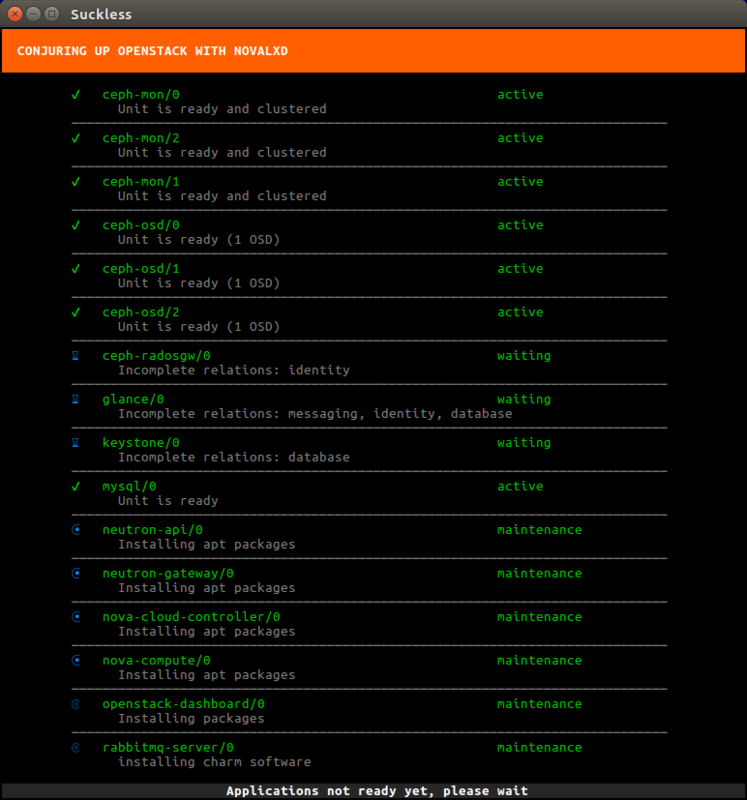 That was all until LXD 2.3 when LXD finally grew its own network management API and command line tools to match. This post is an attempt at an overview of those new capabilities. Right out of the box, LXD 2.3 comes with no network defined at all. “lxd init” will offer to set one up for you and attach it to all new containers by default, but let’s do it by hand to see what’s going on under the hood. Having a network created and running won’t do you much good if your containers aren’t using it. If you want to do a bunch of changes all at once, “lxc network edit” will let you edit the network configuration interactively in your text editor. One of the nice thing with having LXD manage the DHCP server for you is that it makes managing DHCP leases much simpler. All you need is a container-specific nic device and the right property set. And same goes for IPv6 but with the “ipv6.address” property instead. “managed” will have one DNS record per container, matching its name and known IP addresses. The container cannot alter this record through DHCP. “dynamic” allows the containers to self-register in the DNS through DHCP. So whatever hostname the container sends during the DHCP negotiation ends up in DNS. “none” is for a simple recursive DNS server without any kind of local DNS records. The default mode is “managed” and is typically the safest and most convenient as it provides DNS records for containers but doesn’t let them spoof each other’s records by sending fake hostnames over DHCP. On top of all that, LXD also supports connecting to other hosts using GRE or VXLAN tunnels. A LXD network can have any number of tunnels attached to it, making it easy to create networks spanning multiple hosts. This is mostly useful for development, test and demo uses, with production environment usually preferring VLANs for that kind of segmentation. So say, you want a basic “testbr0” network running with IPv4 and IPv6 on host “edfu” and want to spawn containers using it on host “djanet”. The easiest way to do that is by using a multicast VXLAN tunnel. This type of tunnels only works when both hosts are on the same physical segment. This defines a “testbr0” bridge on host “edfu” and sets up a multicast VXLAN tunnel on it for other hosts to join it. In this setup, “edfu” will be the one acting as a router for that network, providing DHCP, DNS, … the other hosts will just be forwarding traffic over the tunnel. Now you can start containers on either host and see them getting IP from the same address pool and communicate directly with each other through the tunnel. As mentioned earlier, this uses multicast, which usually won’t do you much good when crossing routers. For those cases, you can use VXLAN in unicast mode or a good old GRE tunnel. The tunnel id is required here to avoid conflicting with the already configured multicast vxlan tunnel. And that’s how you make cross-host networking easily with recent LXD! 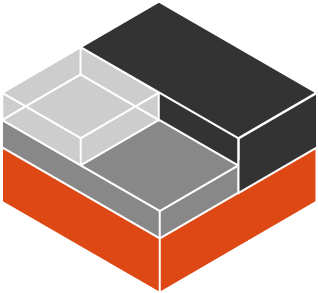 LXD now makes it very easy to define anything from a simple single-host network to a very complex cross-host network for thousands of containers. It also makes it very simple to define a new network just for a few containers or add a second device to a container, connecting it to a separate private network. While this post goes through most of the different features we support, there are quite a few more knobs that can be used to fine tune the LXD network experience. This is the eleventh blog post in this series about LXD 2.0. First of all, sorry for the delay. It took quite a long time before I finally managed to get all of this going. My first attempts were using devstack which ran into a number of issues that had to be resolved. Yet even after all that, I still wasn’t be able to get networking going properly. I finally gave up on devstack and tried “conjure-up” to deploy a full Ubuntu OpenStack using Juju in a pretty user friendly way. And it finally worked! So below is how to run a full OpenStack, using LXD containers instead of VMs and running all of this inside a LXD container (nesting!). This post assumes you’ve got a working LXD setup, providing containers with network access and that you have a pretty beefy CPU, around 50GB of space for the container to use and at least 16GB of RAM. Remember, we’re running a full OpenStack here, this thing isn’t exactly light! OpenStack is made of a lof of different components, doing a lot of different things. Some require some additional privileges so to make our live easier, we’ll use a privileged container. We’ll configure that container to support nesting, pre-load all the required kernel modules and allow it access to /dev/mem (as is apparently needed). Please note that this means that most of the security benefit of LXD containers are effectively disabled for that container. However the containers that will be spawned by OpenStack itself will be unprivileged and use all the normal LXD security features. lxc init ubuntu:16.04 openstack -c security.privileged=true -c security.nesting=true -c "linux.kernel_modules=iptable_nat, ip6table_nat, ebtables, openvswitch, nbd"
Then we need to add a couple of PPAs and install conjure-up, the deployment tool we’ll use to get OpenStack going. And the last setup step is to configure LXD networking inside the container. And that’s it for the container configuration itself, now we can deploy OpenStack! As mentioned earlier, we’ll be using conjure-up to deploy OpenStack. This is a nice, user friendly, tool that interfaces with Juju to deploy complex services. This will now deploy OpenStack. The whole process can take well over an hour depending on what kind of machine you’re running this on. You’ll see all services getting a container allocated, then getting deployed and finally interconnected. Once the deployment is done, a few post-install steps will appear. This will import some initial images, setup SSH authentication, configure networking and finally giving you the IP address of the dashboard. The dashboard runs inside a container, so you can’t just hit it from your web browser. Where “<ip>” is the dashboard IP address conjure-up gave you at the end of the installation. This can take a few minutes to load the first time around. Once the login screen is loaded, enter the default login and password (admin/openstack) and you’ll be greeted by the OpenStack dashboard! You can now head to the “Project” tab on the left and the “Instances” page. To start a new instance using nova-lxd, click on “Launch instance”, select what image you want, network, … and your instance will get spawned. Once it’s running, you can assign it a floating IP which will let you reach your instance from within your “openstack” container. OpenStack is a pretty complex piece of software, it’s also not something you really want to run at home or on a single server. But it’s certainly interesting to be able to do it anyway, keeping everything contained to a single container on your machine. Conjure-Up is a great tool to deploy such complex software, using Juju behind the scene to drive the deployment, using LXD containers for every individual service and finally for the instances themselves. It’s also one of the very few cases where multiple level of container nesting actually makes sense! Snaps were introduced a little while back as a cross-distro package format allowing upstreams to easily generate and distribute packages of their application in a very consistent way, with support for transactional upgrade and rollback as well as confinement through AppArmor and Seccomp profiles. It’s a packaging format that’s designed to be upstream friendly. Snaps effectively shift the packaging and maintenance burden from the Linux distribution to the upstream, making the upstream responsible for updating their packages and taking action when a security issue affects any of the code in their package. The upside being that upstream is now in complete control of what’s in the package and can distribute a build of the software that matches their test environment and do so within minutes of the upstream release. Why distribute LXD as a snap? We’ve always cared about making LXD available to everyone. It’s available for a number of Linux distribution already with a few more actively working on packaging it. For Ubuntu, we have it in the archive itself, push frequent stable updates, maintain official backports in the archive and also maintain a number of PPAs to make our releases available to all Ubuntu users. Doing all that is a lot of work and it makes tracking down bugs that much harder as we have to care about a whole lot of different setups and combination of package versions. Over the next few months, we hope to move away from PPAs and some of our backports in favor of using our snap package. This will allow a much shorter turnaround time for new releases and give us more control on the runtime environment of LXD, making our lives easier when dealing with bugs. How to get the LXD snap? Those instructions have only been tested on fully up to date Ubuntu 16.04 LTS or Ubuntu 16.10 with snapd installed. Please use a system that doesn’t already have LXD containers as the LXD snap will not be able to take over existing containers. Make sure you don’t have a packaged version of LXD installed on your system. Create the “lxd” group and add yourself to it. This will get the current version of LXD from the “stable” channel. For LXD, we currently use “stable”, “candidate” and “edge”. “stable” contains the latest stable release of LXD. “candidate” is a testing area for “stable”. We’ll push new releases there a couple of days before releasing to “stable”. “edge” is the current state of our development tree. This channel is entirely automated with uploads triggered after the upstream CI confirms that the development tree looks good. This will cause your system to install the current version of LXD from the “edge” channel. Be careful when hopping channels though as LXD may break when moving back to an earlier version (going from edge to stable), especially when database schema changes occurred in between. Snaps automatically update, either on schedule (typically once a day) or through push notifications from the store. On top of that, you can force an update by running “snap refresh lxd”. We don’t currently support live-migration (CRIU) with the LXD snap. The “lxd” group must exist prior to installation. Updating the snap restarts all LXD containers. 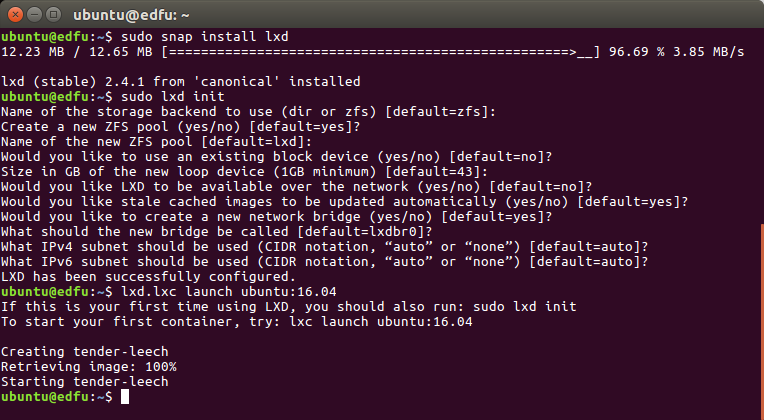 The “lxd” snap can’t provide the “lxc” command (use “lxd.lxc”). LXD always runs even when it’s unused. Those are all pretty major usability issues and will likely be showstoppers for a lot of people. We’re actively working with the Snappy team to get those issues addressed as soon as possible and will keep maintaining all our existing packages until such time as those are resolved. PS: I have not forgotten about the remaining two posts in the LXD 2.0 series, the next post has been on hold for a while due to some issues with OpenStack/devstack.